We’ve all known for some time that the gleaming promise of scientific and mathematical proficiency and progress this country made to itself and its students after Sputnik launched in 1957, and that President Kennedy articulated as a challenge to ‘put a man on the moon by the end of the decade’ in 1961, has been broken. Our collective determination to raise the competency in math and science of all our students and citizens perhaps came to a brief fruition, but for more than two decades we’ve been sliding away from that dream of achievement. No news there. But now and then I’m shocked at just how low standards have fallen. Set aside that in 2007 U.S. students ranked 23rd out of 30 in scientific proficiency among industrialized countries, and that 12th grade U.S. students rank, at best, 19th in math proficiency. Peer-reviewed studies are great, but all we need is the picture above. 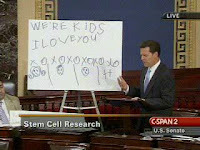 Yes, my friends, this is a United States Senator with a “drawing” of an embryo, explaining his opposition to stem cell research. To be clear: Legal Voice takes no positions in partisan political races, so we don’t care that this is Kansas Senator Sam Brownback, currently the front-runner to become Governor of that state. (Well, we don’t care for this purpose.) What we do care about is that he is seriously trying to persuade people of his position, and that this is his scientific visual aide. The level of discourse (including visual aids) about critical issues in science, bioethics and policy just can’t stay at this level if we are to have a hope of operating competently in a global economy, let alone make wise policy decisions. Can it?